Aquatic therapy is a type of therapy that takes place in a pool or other aquatic environment. It is a physical and medical rehabilitation specialty that requires the supervision of a trained professional. It is also known as aqua therapy, aquatic rehabilitation, pool therapy, or hydrotherapy. There are many purposes of aquatic therapy, which depends on the individual’s needs and goals. Some of the common goals of aqua therapy include: improve flexibility, improve balance and coordination, promote relaxation, and increase muscle strength and endurance. Aquatic therapy is typically offered in hospitals, sports medicine clinics and outpatient rehabilitation centers. 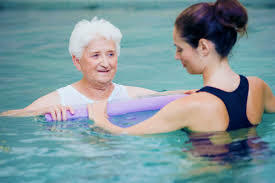 Aquatic therapy can be used as effective therapeutic modality in stroke recovery in combination with traditional PT and OT. Therapy in the water allows the patient greater mobility because body weight is decreased significantly (up to 90%). Since the water aids balance, the patient has an easier time with flexibility and stretching muscles. Buoyancy allows for increased success in movements with decreased effort. Some stroke survivors, who cannot walk on land, find it quite easy to stand up and even walk in a pool. The same principle applies to the arm; the properties of the water can be used by an experienced clinician to create movement and re-educate the brain. As the signals from the brain to the extremity get stronger, the patient’s position in the water can be adjusted to increase the difficulty or tools, such as weights, can be added. Before starting aquatic therapy it is important to obtain medical clearance from the supervising physician. Who Can Benefit From Aquatic Therapy Other than Stroke? There is a wide range of individuals who can benefit from this service and is available for all age groups. This includes those with disabilities and other conditions, such as: autism, balance disorders, arthritis, cerebral palsy, Parkinson’s disease, multiple sclerosis, idiopathic joint pain, spinal cord injury, traumatic brain injury and more. A trained professional utilizes the session for any age-related limitation in order to create a positive therapeutic experience.